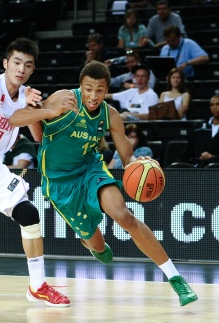 Australian combo guard with unlimited upside. Has a chance to be one of the best international prospects of the past decade. Has point guard skills in a long, 6-6 body with great athleticism. Exum has exceptional quickness and explosiveness. Gets by defenders with a lightening quick first step and then elevates effortlessly. An elite level athlete with great hops and good strength. Possess a smooth and accurate shot. Has a plethora of moves and can get to the rim or hit from mid range. Very willing passer who is asked to take over games at his current level but should continue to develop his lead guard skills. Very pesky defender who takes pride in shutting down opponents. Uses his quickness well and is a true ballhawk. Uses his length well to tip passes and block shots. Will have to continue to add strength and fill out his body. The strength of guards in the NBA will take some getting used to. Has a somewhat flat shot which could use more arc.